Digital Signage Specialist ONELAN has installed a digital signage network in Ferney, a large retailer, in the Netherlands. The Ferney Group is a long established retail cooperative comprising 67 independent hardware businesses making it the largest purchasing organisation in the Netherlands. With over 150 outlets across Belgium and the Netherlands, Ferney is continually looking for new, innovative marketing tools to enable each cooperative member to maximise it’s sales, while keeping costs under control. The organisation decided that they should install a digital signage network solution in their stores that included central control as well as local customisation and a reporting facility. The ONELAN Digital Signage network was chosen by Ferney as the best solution for their stores, due to its scalability, Central Control and Ad-hoc features. It was the combination of these features that allowed Ferney to build a solution using Central Control to create 8 layouts in a schedule (with a pre-determined order for the layouts to be shown), two of which that could be designed by the individual stores. Each layout has 5 Zones, 4 ad-hoc, allowing customisation tailored to local market requirements, and one with a clock. As an example one store may sell a different mobile phone to another store. 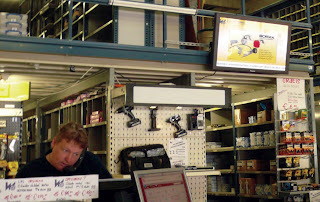 In one of the pre-created layouts from Central Control the store can change the mobile phone shown in the layout, to the one they actually sell. For marketing purposes this has given Ferney excellent feedback on how each store positions themselves and which products they feel are the most important to their local market. With the Central Control reporting functionality they are able to receive this feedback and then produce a hard copy catalogue with relevant content for a particular store. With the edge over the competition, a significant ROI has been achieved since the installation took place. This has led to the recruitment of three full time staff who maintain the smooth running of the network across the stores. Digital Signage Specialist ONELAN has extended its global coverage by appointing its fifth Arabic Reseller in the Middle East in recent months. Key to this is the latest V7.1 software which has a full Arabic language interface. This combined with the capability to scroll Arabic RSS text from left to right, makes the company’s solution very attractive for the key digital signage markets in this territory. In the last 6 months ONELAN has made a fast entry into the market being awarded two significant contracts; one with a major Bank and another with a mobile phone retailer. Combined with strong trading in the UK, business in the Middle East has helped propel ONELAN to a 65% increase in sales in Q1. ONELAN will be at Palme Middle East Exhibition (26-28th April) in Dubai Stand No 8C39 with Dutco Tennant LLC. ONELAN will be at Palme Middle East Exhibition (26-28th April) in Dubai Stand No 8C39 with Dutco Tennant LLC. The Exhibition is the region's largest dedicated trade show for professional audio, lighting, music, entertainment, audio visual and systems integration solutions. March 2009…… Digital Signage Specialist ONELAN today announce their latest software release V7. The latest software has some exciting new features that enhance the interactivity and performance of the full range of media players from ONELAN. The Native PowerPoint Player feature has been introduced in response to user demand from Corporates and the world of Education where ONELAN has a stronghold. Supporting most visual effects and versions, and the ability to manipulate both inter and intra-slide timings and transitions of the original, a page can be displayed scaled within the zone of a layout. This feature makes it even simpler to update content on a regular basis with information relevant to a particular audience. With a rapidly growing user base, ONELAN has sought customers’ feedback and responded with new user requested features. Most significantly the Net Top Box (NTB) Graphical User Interface (GUI) has been given a full makeover, making it easier to use and more intuitive for even a novice user to navigate. Another interesting new feature is Text Update from Centre. The ability to update text from a central Publisher to multiple remote Subscriber locations, makes it possible to publish instant messages from a central location e.g visual paging of guests hotelwide.